The Grand Lodge of Scotland celebrated its’ 275th Anniversary in 2011 having been founded in 1736. 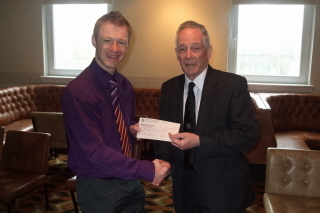 It adopted the slogan ”Scottish Freemasons Caring and Sharing – Celebrating 2011 by Helping Others”. As part of that celebration Grand Lodge released £275,000.00 to be disbursed to Provincial and District Grand Lodges under its umbrella throughout the world. The Province of Stirlingshire was awarded £6,389.00 from that sum. Provincial Grand Lodge decided that this sum be divided equally between the five main Charities it had supported in 2011. Click logo for further info. Kidney Kids Scotland - Kidney Kids Scotland was founded in 2000 to help Scottish children with renal and urology problems and their families. The charity does its utmost to support these families in any way that it can. This can often just be a listening ear or putting them in contact with another family with similar problems or giving them much needed financial help. Kidney Kids Scotland provides support to hospitals all over Scotland supplying them with machinery and funding for essential posts. Many thanks for putting your article in about Kidney Kids Scotland. On behalf of Kidney Kids Scotland I would like to say how grateful we are for the support given by yourselves and to assure you that this donation will go in full towards our next project. I always feel it is important to let people know that the money being donated will be used directly to support the children at the project. Once again thanks for your on going support and best wishes for the future. Crossroads Care Scotland (Falkirk) - the national charity dedicated to the provision of short breaks for carers within their own homes. Established in 1978, they have services throughout Scotland providing practical support for carers of all ages. Caring at home for someone who is perhaps elderly, suffering from illness or living with a disability can be highly rewarding but hugely challenging. It is all too easy for the carer to become ill as a direct result of the stresses of caring - often leading to hospitalisation of the carer and the cared for person. Crossroads can help - by taking over the caring responsibilities for a short period allowing the carer to take time to themselves. I attended the presentation ceremony with Morven Mack and, as I have only recently started working with Crossroads Scotland, it was an ideal opportunity to find out about the work you do and I enjoyed meeting everyone including the representatives from other organisations. I would like to take this opportunity to say thank you for your very generous donation to our service. This will enable us to provide additional support for carers and will be used to provide extra support to those who need it most. Erskine Homes - Founded in 1916, Erskine has provided nursing and medical care for members of our Armed Forces ever since - rebuilding shattered lives and providing first class care. Every year over 1300 ex-Service and Serving people throughout Scotland benefit from Erskine's help. But we can only provide this high quality care with your help. Strathcarron Hospice - cares for people with illnesses that cannot be cured including cancer, respiratory and heart conditions and neurological diseases. They are a charity providing specialist palliative care free of charge to people in NHS Forth Valley, and to Cumbernauld and Kilsyth in NHS Lanarkshire. Their care is provided wherever it is needed. This may be within the hospice in Denny, but also in patients’ homes, in the local hospital Forth Valley Royal Hospital, care homes and community hospital settings. Care is also extended to families and carers. The donation was really helpful and most generous and will enable us to purchase a much needed specialist bed and some new pressure relieving mattresses for our ward. Brother Andrew A. McKinnon, RWPGM, made the presentations to the various charities on Saturday 24th March in Lodge St. Andrew (Denny & Loanhead) No. 176. 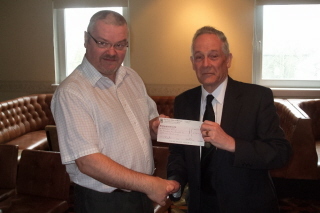 Between them the 23 Lodges in the Province of Stirlingshire donated £17, 487.00 to local and national Charities and good local causes in 2011. 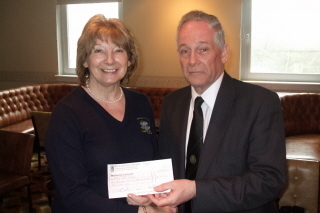 In addition the Provincial Grand Lodge of Stirlingshire organised a Reigning Masters Degree, Golf Competition, Fishing Competition and Bowls Competition so amassing the sum of £8,800.00 . It can readily be seen that between the Grand Lodges donation of £6,389.00, Provincial Grand Lodges various donations of £8,800.00 and its’ Daughter Lodges various donations of £17,487.00 making a total donation to Charity and good causes throughout 2011 of £32,676.56. The RWPGM thanks you all for your magnificent effort. for £15,189.00 being the total amount donated.